AGTECH INVESTMENT TOPPED $10 BILLION IN 2017. HOW MUCH WENT TO WOMEN? Now, a new generation of startups led not just by women, but by minority women specifically, is seeking to solve agriculture’s problems with tech innovation. I am back in Salinas, California. It is spring, and the mountains are lush and green. Everywhere there are signs of healthy rainfall. In some ways this city is lost in time, seemingly unchanged from the poetic descriptions of the place that Nobel Prize-winning author John Steinbeck, who was born and raised here, used as a backdrop for his stories. On the drive on Highway 101 from San Jose—the heart of Silicon Valley—chrome, metallic, and candy-colored office buildings; a matrix of start-ups, high-tech behemoths, and venture capital firms morph into rolling green hills that bookend the farmland. Salinas is synonymous with industrial agriculture. An estimated 80 percent of all the leafy greens consumed in the United States every year is grown in the Salinas Valley, and agriculture here is a $9 billion industry. Drive through Salinas and the fields are packed with laborers, picking and cutting at lighting speed. But over the last five years another industry has emerged from this endlessly agricultural landscape. It’s known as “ag-tech,” and yes, it’s exactly what it sounds like: a marriage between agriculture and technology that strives to make farming more efficient and cost-effective through the latest technological innovations. Walk down Main Street in the heart of Salinas, where mom-and-pop shops and a stable of restaurants and coffee spots define the stretch, and the presence of a burgeoning ag-tech industry might not be so obvious. But adjacent to the National Steinbeck Center, which anchors the end of the street, is the Taylor Building. It is home to two significant headquarters—for Taylor Farms, one of the largest fresh produce companies in the country, and the Western Growers Center for Innovation and Technology, which houses multiple ag-tech startups from the U.S. and abroad. The center opened in 2015 with just a handful of ag-tech companies, and now boasts nearly 55 startups, several of which were founded or are led by women. But despite some modest advancements in gender equality in other sectors, agriculture and technology remain two of the most male-dominated industries in the country. In 2017, women-led startups across all sectors combined received $1.9 billion of the $85 billion total invested by venture capitalists, according to PitchBook, a data research company. That’s just 2 percent of what went to men. But data on investments in women-led ventures in the ag-tech field specifically are spottier. While I was able to source data on the growth of the sector as a whole, I wasn’t able to find any numbers that looked at investor interest in women-led enterprises in particular. In some ways, agriculture remains an industry wedded to tradition. Many farms and agriculture companies are family businesses that continue to be passed down from generation to generation. And many are run by men. But the gender dynamic may be shifting slightly—at least in terms of chosen profession. According to the World Bank, women make up almost half of the world’s farmers, and over the last few decades, they have become increasingly involved in the agriculture industry. There’s another development: Now, a new generation of startups led not just by women, but by minority women specifically, is seeking to solve agriculture’s problems with tech innovation. Women were certainly working in the fields. Who were the women CEOs leading farms or ag companies? At the Salinas Valley AgTech Summit at Hartnell College in March, I had the privilege of exhibiting FromFarms to Incubators–my multi-media journalism initiative. It showcases the work of minority women entrepreneurs in ag-tech, who specialize in everything from robotics to genetic soil testing to mobile apps that generate data analysis for growers from photos alone. They are also actively using drones. The timing seems perfect for the products of this ag and tech fusion to take off. Right now, the agriculture industry is particularly burned out by a collision of challenges, all unfolding at once: severe labor shortages as field workers age out, low commodity prices, and increasing risk. Add to that the pressing threat of climate change, a steady shift to the grow local, buy local ethos, and big farming—such as it is in the Salinas Valley—is suffering. At the same time, the entire globe is faced with an ongoing “feed the world” mandate from our ever-increasing population, forecasted to reach 9.1 billion by 2050. The Chinese character for “crisis” is a combination of the characters for “danger” and “opportunity.” If you were to apply that same linguistic logic to ag-tech’s emergence in what some have called a sleepy city, then it would make sense that along with the area’s ongoing crises also came a series of opportunities for a new generation of entrepreneurs. This is a story, at least in part, about how Salinas helped advance the sector from 31 deals and $200 million in investments in 2007, to one that now commands $3 trillion in value at the farm gate. In 2013, Salinas’s then-Mayor Dennis Donohue, city manager Ray Corpuz, Jr., and other key city leaders made an important commitment after they had faced their own crisis: Capital One bank closed up shop in 2012 and left nearly 1,000 people without jobs. So they collectively chose ag-tech to be the sector they would grow and develop, with the goal of creating a knowledge-based workforce that could take advantage of higher paying jobs. A new generation of startups led by minority women is seeking to solve agriculture’s problems with tech innovation. At the same time, Silicon Valley’s investment community, led by venture capital companies, started to recognize ag-tech as a sector unto itself, and one ripe for investment. We can likely pin the Valley’s interest to a particularly high-profile 2013 acquisition. When global seed-maker Monsanto acquired The Climate Corporation, a San Francisco-based digital agriculture company known for its weather data and crop insurance offerings, for $1 billion, the ag-tech sector officially went national. According to some trade publications, that deal was responsible for demonstrating to the venture capital community the sector’s significant promise. Since then, a handful of private equity and venture capital firms that focus on food and agriculture have begun to expose their investors to the sector’s potential, too, including Fall Line Capital and Integris Partners, Ltd.
Venture capital investment in agricultural technologies skyrocketed between 2012 and 2015, hitting $8.6 billion in 2015 before falling to $7.8 billion in 2016, according to a report published by AgFunder. That dip reflected the 10 percent drop in overall venture capital markets that year. But with increasing interest in all things green and sustainable plus growing cultural curiosity about food science and biotechnology, there appears to be a turnaround; in 2017 the industry saw investment rise again to $10.1 billion, though there were 200 fewer deals overall than there had been 2016 (994 to 1,197). The contraction in deal activity, says AgFunder, was felt at seed stage especially, as more money was concentrated into fewer, larger deals. And that’s an important industry insight that puts the Monsanto/Climate Corporation deal of five years ago into current context. My search for minority women entrepreneurs in ag-tech really started on the ground. As a food and agriculture reporter for The Salinas Californian, I drove daily past the fields and saw women doing the backbreaking work that’s so critical to the industry. But there was a glaringly obvious split: Women play a tremendous role in agriculture and in making decisions about the food on the table, yet the majority of agriculture-related conferences and meetings I attended were packed with middle-aged white men. Where were the women in the room? They were certainly working in the fields. Who were the women CEOs leading farms or ag companies? And why did the same smattering of names surface repeatedly? Lorri Koster, for example, the CEO of Mann Packing, and her sister Gina Nucci, who ran the company together before selling it to Del Monte for $361 million in February of this year. In early 2017, I attended the THRIVE Innovation Forum, a day-long event in Menlo Park, California, where top ag-tech companies with a connection between Salinas Valley and Silicon Valley are spotlighted in their search for minority women entrepreneurs. “You’re looking for a unicorn,” an attendee said. But after scouring the crowds, I found a handful of women, including Erica Riel-Carden, a former ag- and food-tech attorney at the firm Roger Royse, and Drs. Diane Wu and Poornima Parameswaran, co-founders of Trace Genomics, an agricultural startup that uses genetic sequencing to identify soil pathogens. Women play a tremendous role in ag, yet the majority of meetings I attended were packed with middle-aged white men. Over the course of many months, I continued to find women innovators dedicated to the ag-tech space. And through an International Center for Journalists grant, I was able to profile them: Jessica Gonzalez and Rivka Garcia of HeavyConnect, Miku Jha of AgShift, Wu and Parameswaran, and Le Thuy Vuong of Redmelon. We primarily connected at conferences, over coffee, and over lunch or dinner. I learned that they shared numerous similarities. They were all well-educated, having earned PhDs and MBAs, and they epitomized the American immigrant success story: Some were the first in their family to come to the U.S. They also had strong STEM backgrounds. And some, like Jha, already had a history of successfully launching companies behind them. I asked each of them to share their stories and to tell me their personal histories. I wanted to know what had motivated them to start ag-tech companies in a sector where they were minorities in every conceivable way. For some of the women, inspiration was born from a passion for science coupled with the drive to make a difference. Le Vuong, for instance, is a hardworking and intense woman who grew up in Vietnam. She holds a PhD in nutrition from the University of California, Davis, and is the founder and CEO of The Redmelon Company, for which she developed the signature product, an edible oil made from the highly nutrient-rich red melon fruit. It’s a product Vuong created specifically to address vitamin A deficiency in mothers and children who live in rural Vietnam. Vuong witnessed firsthand the ravages of vitamin A deficiency in her country, a common result of malnutrition. And she found a solution in Gac (or red) melon, which is grown widely throughout Southeast Asia and is remarkably high in beta-carotene, lycopene, and zeaxanthin. “I identified red melon as the richest source and the precursor of vitamin A. I realized we can improve the hemogloblin concentration of these children, and increase vitamin A and prevent deficiency in these children,” Vuong says. In 2012, Vuong launched a company she initially called Fishrock Labs, which was inspired in part by Pam Marrone, the founder and CEO of Marrone Bio Innovations, a NASDAQ listed, bio-based pest management company in Davis, California. Marrone has since become Vuong’s mentor. Vuong first used the red melon extracts to make consumer-focused products like lotions, along with the edible oil, and the items sold out in 2016. After that, she increasingly turned her focus to fundraising and building a team. In 2017, Redmelon was accepted into Fourthwave, a California-based accelerator program that focuses on women-led companies. And it was there that Vuong says she had an epiphany about fundraising. She stopped focusing on traditional venture capitalists, who she had approached but didn’t bite, and instead began to explore alternate routes for growth—merging with companies that share a similar mission of health and wellness, and are complementary, for example. “I realized there’s a way for me to fulfill the mission that I set out with: a personal mission [that] at the same time [makes] a profitable company,” she says. Other women, like Jessica Gonzalez, who co-founded HeavyConnect and left the company in late 2017, grew up surrounded by agriculture. Her parents Salvador and Angela immigrated to California from their native Metrocan, Mexico, first worked as farm laborers in Salinas, and later started a produce company in Selma, a small farming city just outside of Fresno. Gonzalez, who is 27 years old, says that growing up, she and her eight siblings worked on the farm and in the family business after school. She studied engineering as part of the CSIT-in-3 (computer science in three years) program at Hartnell College in Salinas, followed by study at Cal State Monterey Bay (a fast-track program for computer science and engineering), and considered a career at one of the many high-tech companies that define the Bay Area. But she also had a passion for agriculture and the opportunity to build a company from the start. 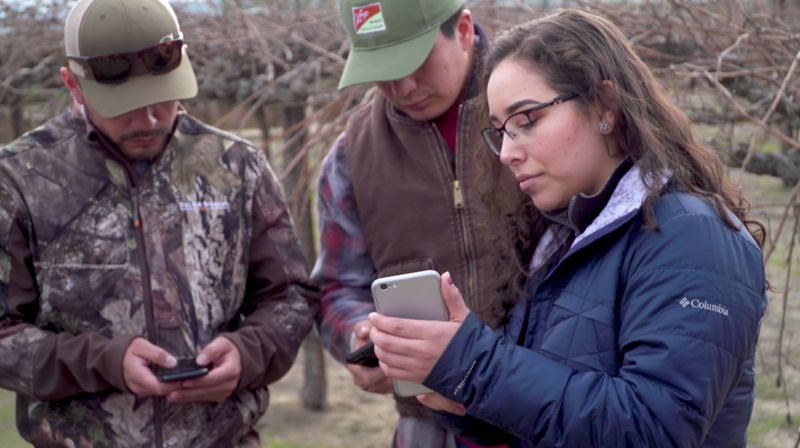 So in 2015, Gonzalez joined HeavyConnect, a Salinas-based ag-tech company that creates mobile apps that make processes like payment and employee management easier for growers. The company is led and was co-launched by Patrick Zelaya, a sales manager at John Deere, who made it a point to hire homegrown talent. “I knew I wanted to go back to agriculture but I didn’t know how exactly I could incorporate my technical skills. HeavyConnect allowed me to go back, and I felt like I was making an impact on the space,” she says. I first met Gonzalez, a slip of woman who is soft-spoken, thoughtful and reflective, in 2016. She and Rivka Garcia, HeavyConnect’s chief engineer, both alumni of the CSIT-in-3 program, often attended ag-tech conferences together. But a year later, I was somewhat surprised to learn that Gonzalez had left the company and was back with family in Merced, in the San Joaquin Valley. She told me she’d returned home to help with the family business after her father was diagnosed with cancer. It was news that somewhat saddened me. It appeared her aspirations were cut short. Food enterprises will continue to drive, if not inspire, more women to get into the business. Last month, I caught up with Gonzalez again. She said things were looking brighter. The family farm and business were picking up steam, and her father was receiving a new treatment. She has been able bring her technology expertise to the work she does with her family, including fully automating their payment processes. The citrus orchard will soon use an automated irrigation system. “We are using more tech, which is great,” Gonzalez said. Her time at HeavyConnect allowed her to take a lead on the farm, which had traditionally been run by her father and brothers. “I think it gave me the confidence … before that I didn’t feel like I had the authority. HeavyConnect really helped me find that. Although I studied computer science I never thought to apply it to the family business, so that bridged it for me,” she said. Gonzalez told me that she felt her timing, getting into ag-tech in Salinas when she did, and as a minority woman, had been good. She said she now plans to use her startup skills to launch a company that “promotes local food and healthy food here in this community.” It could be in the form of a community garden or a website, she mused. When I re-connected a year later with the women we’d initially interviewed, I found they remained committed to their work in ag-tech and were continuing to forge ahead, whether in fundraising or in bringing their products to market. Vuong has been trying to get her company up and running since 2012, and says she has only recently—over the past year—seen a rise in women entering the field and more support for women entrepreneurs. Vuong is holding on to thousands of seeds and grows her own melons at a farm near her home in a Sacramento suburb. She continues to search for a company to merge with. Trace Genomics recently launched its own office in Salinas and to date has raised upwards of $6 million. PastureMap, founded and led by Christine Su, recently raised $2.3 million from Eric Chen of the Ovo Fund. AgShift, led by Mika Jha, raised $2 million and signed its first client. Pina is a first-time entrepreneur “with just a lot of heart, passion, and a realistic mindset,” she says. And Pina thinks that food enterprises—especially those with a sustainability bent and a passion for wellness—will continue to drive, if not inspire, more women to get into the business. “Women align more and identify with the need and consumer sentiment to connect food with drivers such as increased nutrition, overall wellness, and sustainability. Each of these three drivers allow for a new innovation involving product development, supply chain, and/or cultivation,” she says. And this story extends far beyond Salinas Valley, of course. It extends beyond the states and the country. It extends beyond ag-tech, too. When I asked Micki Seibel, an advisor currently consulting at Social Capital, a venture capital firm based in Palo Alto, to tell me whether she sees a shift in the tectonic plates, she told me in an email that it isn’t just ag-tech that’s changing. It’s tech, period. The future in any sector comes down to the workforce. And in ag-tech it’s a swiftly changing and increasingly diverse one, says Donohue, pointing to the fierce competition between the agriculture and technology industries for top talent. California Assemblywoman Anna Caballero, who represents the 30thdistrict, which includes the Salinas Valley, continues to point to the importance of programs that encourage girls and young women to explore opportunities in STEM. These include Coder DOJO, DigitalNest and CSIT-in-3, which will hopefully graduate more and more young women like Gonzalez. “I see a real shift, both in terms of women and women of color as well—which is really important. You have to create the pipeline and it is being created in Salinas,” Caballero says. Her goal is to create economic opportunities for women in rural areas too, and she says she hopes to encourage more agribusiness and vocational programs at community colleges. Caballero is starting to see more women in management positions in the fields, in the office, in laboratories, and yes, in innovation centers as well, she says. The landscape is slowly changing. The natural beauty of the Salinas Valley, with its picturesque mountains, near perfect weather, and endless acres of farmland is likely to remain fundamentally the same. But the social and professional geography is starting to look different, as this new generation of innovators is emerging and beginning to make names for themselves. What will we call this generation? I’ll answer that with a truism that accompanies hopes for an abundant harvest at the start every new planting season: Only time will tell. This article was written by Amy Wu, an investigative journalist who reports on the environment and agriculture. She is also the creator and director for From Farms to Incubators: Telling the Stories of Minority Women Entrepreneurs in Agtech in the Salinas Valley and Beyond. The project includes a documentary and a website that profiles women entrepreneurs in ag-tech and ag.